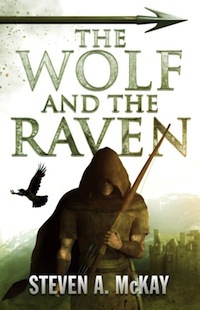 I am delighted to have Steven A. McKay, author of bestselling novels Wolf’s Head and The Wolf and the Raven, visit with me today. Steven introduced me – and thousands of other readers I imagine – to Robin Hood in 14th century Yorkshire. Wait! What happened to the Sheriff of Nottingham? 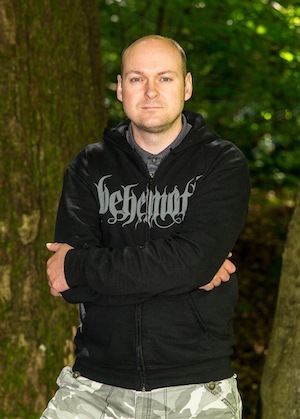 I’ll let Steven talk about his research and writing, and maybe I will get some insight about self-publishing from this indie author who is rocking the Amazon charts. CN: Welcome, Steven! Let’s jump right in. Why Robin Hood in the 14th century? SM: When I started researching the Robin Hood legend I found out there was quite a lot of evidence that the “real” man had lived around that period. The ballads mention things that fit with the early 14th century and, to be honest, I was very pleased to find that out as it allowed me to put a new spin on the tale. Ultimately, no one will ever know when he lived, or even if there was a real person that all the stories were based on, but setting my series in the 14th century meant I could bring some new historical characters into the mix and, hopefully, make things fresh for the readers. The most surprising thing for me, and pretty much everyone else that’s read the books, is the fact that there’s such a strong case for Robin Hood being from Yorkshire rather than Nottingham. All the early ballads place him in Barnsdale forest rather than Sherwood. Along with the time period, that really sets my version of the legend apart from other authors or film-makers. CN: I’ll be honest – medieval English history isn’t high on the radar in U.S. primary and secondary schools except for the Norman Conquest and Magna Carta, with maybe a smattering of War of the Roses. I knew very little about 14th century England until I read Wolf’s Head. I thoroughly enjoyed the book and the historical background you included. I’ve been spoiled by television and movies using Nottingham, but delighted to learn about a time and place I wasn’t so familiar with. I imagine many of your readers feel the same – and those in Yorkshire are probably thrilled! What’s the best part of the writing process for you? What has been the most challenging? SM: I love sitting down to write with an idea of what’s going to happen, only to find the characters pull me in a completely different direction. It really feels like the books write themselves sometimes with only limited input from me! The most challenging thing is finding time to sit down and actually write. I have no problem planning scenes and coming up with a clear idea of how to get from point A to point B, but it’s really hard to get a spare couple of hours sometimes. CN: How long did it take you to write your first book? What is the most important thing you learned in that process? SM: I think it was about three years, but that included a lot of time researching the period and figuring out how Wolf’s Head should pan out. My first draft was very different to how it eventually turned out, with some fantasy/supernatural elements and less of the historical detail. My editor really helped me sharpen things up in that regard. The most important thing I learned is that it’s possible – for me at least – to write whenever I feel like it, even if it means writing nothing for weeks or months at a time. My family suffered a very traumatic experience while I was working on that first book and at times I didn’t feel like writing for long periods. But I managed to come back after each break and continue on where I’d left off. So, now, when I find myself struggling for time I know I don’t need to panic – it’ll come good in the end! 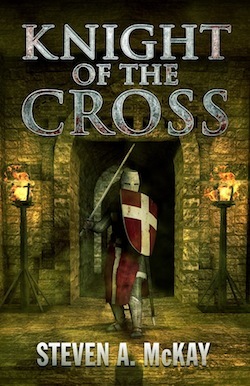 CN: With two successful novels published, you’ve now written a novella, Knight of the Cross. What prompted you to go that route? What has that journey been like? SM: I’ve always wanted to write something with elements of the supernatural but my “straight” historical fiction novels didn’t allow it. I also wanted to write something about Sir Richard-at-Lee’s time in Rhodes with the Hospitallers so…it seemed a good idea to combine the two. 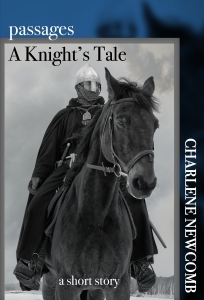 Obviously, my main focus is my Forest Lord series which revolves around Robin Hood, and I didn’t want to take too much time out from working on the next book in that series so I decided to make Knight of the Cross a novella as it wouldn’t take too long. I also thought it might be a good marketing strategy: pricing it at 77p is almost as good as giving it away for nothing, right? [CN: that’s $.99 in the US, folks!] 77p barely even buys you a bar of chocolate these days, which’ll last you two mintues! So I’m hoping people that might not have read my full-length, full-price novels will take a chance on the novella and enjoy it enough to try my other work. CN: That sounds like a great strategy, and the shorter length allows you a bit of a break. Like me, you hold down a full time job. What is your typical day like? When do you find time to write? SM: I really don’t have a “typical” day. Generally, my wife takes the kids out to her parents’ a couple of times a week and I spend that time when I have the house to myself writing as much as possible. Since the time is so limited it’s really important that I know pretty much what I’m going to be writing when I do sit down with the music on and the laptop out. Luckily, I do a lot of driving in my job and I use that time to plan things. Today, for example, I had about a four hour round trip from my house to a site in Dumfries to do some work on a gas meter. Those four hours were spent listening to Jethro Tull and working out what I’m going to write on Thursday evening! CN: Are you a plotter or a pantster? SM: Both, if I understand you right….I have a basic outline for each scene in my head, and a basic outline for how the book should get from beginning to end. But when I sit and start to write I really let the characters go where they want. Usually they go where I expected them to, but every now and again something I didn’t expect happens. In The Wolf and the Raven for example, I planned on someone getting shot by Sir Guy of Gisbourne, but as I wrote it, someone else took the hit. I was happy to go with it and it opened up a whole new series of events that I’d never expected. CN: Are there certain types of scenes you find harder to write than others? SM: Not really. I’m onto my third novel now though, obviously with the novella out there too, so it’s important to try and not keep repeating myself when it comes to things like fight scenes. That’s when reviews really come in handy. I read them all and sometimes you get a really valuable piece of feedback that tells you you need to take care not to overuse something. For my novella I looked at scary scenes in books by guys like Stephen King – I don’t read horror so I wanted to make sure I was doing it right! In the end, though, I just wrote the supernatural parts the same as I write everything else. I hope it worked out okay. CN: The novella looks like it is in the top 100 on the Fiction > War charts at the moment, so I’d say it’s working out quite well! Do you have a favorite scene from any of your books? Which one & why? 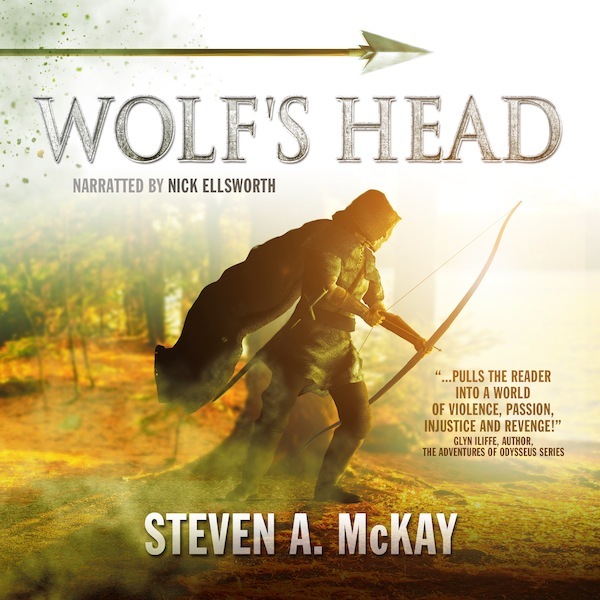 SM: Yes, the scene in Wolf’s Head where one of the characters is, apparently, mortally wounded but survives. Some readers misinterpreted that section as being a handy miracle, but it’s not about that at all. It’s about a father’s love for his daughter and the power of the human spirit. Although it’s surrounded by the suggestion of divine intervention and religion, it actually – to me at least – has nothing at all to do with that. That one scene tells you a lot about my philosophy if you read between the lines. What writers have inspired you? Any favorite books? SM: Lots! My favourite ever book is probably Lord of the Rings but I was mostly inspired by Bernard Cornwell when I started writing my own novels. In recent years Glyn Iliffe, Douglas Jackson, Anthony Riches and Ben Kane have all really helped me understand how to craft an exciting historical fiction novel, with a good blend of history and action. CN: Cornwell and Tolkien are two of my favorites as well. Now I’ll need to add the others to be ‘to-read’ list. You are a rock musician. I know you play guitar. When did you start? Self-taught? Do you play any other instruments? Tell us about your band. SM: I must have been about 10 when I started learning guitar. I never really made much progress until I realised I could play AC/DC songs on one string and then I really got into it! I started to get pretty good when I was a teenager so my mum sent me to a teacher in Glasgow for lessons and I ended up showing the teacher how to play heavy metal songs I’d learned by listening to records. I also play bass, and can dabble with flute, mandolin and drums. I sing too. My band, Nocturnal Fire, isn’t really a going concern any more unfortunately. We still meet up for a jam when we can, but we’re all busy and it’s impossible to find time to gig or whatever. Once I write a book that sells a million I plan on building a recording studio and spending all my spare time writing rip-offs of Iron Maiden songs! CN: I love the name of your band. We’re all so pressed for time these days, and pulled in so many directions. But that recording studio sounds like a great way to celebrate your success. I’ll be rooting for you. What’s next in your writing? A third or fourth volume in your Forest Lord series? and final, book will follow that. Then…who knows? Early reviews of my Knight of the Cross novella suggest I could look at a full-length novel about Sir Richard. I’m also thinking of another novella or two, with Friar Tuck, Will Scarlet or even Sir Guy of Gisbourne taking centre-stage. What is the best marketing tip you can give another indie writer? SM: Getting good reviews is the best way to start. To that end, I really recommend finding at least half a dozen beta-readers who you think will enjoy your work. Let them have a pre-release copy of your ebook and, if they like it, ask them to leave a review on Amazon, etc., once the book is published. Remember, you’re looking for genuine reviews so asking ten family members to write gushing praise with a 5 star rating is pointless – buyers will see through it! CN: Thanks for that tip, Steven. On a final note, I must mention that you are a two–time IndieB.R.A.G. medallion honoree! And thank you for taking the time to talk with me about your writing. Congratulations on your success. You are an inspiration to indie authors everywhere. Is the world ready for another Robin Hood tale? Did I mention Robin Hood? ← Is the world ready for another Robin Hood tale? Great interview! I’ve not heard of Steven or his books before, but will certainly look them up now. Great, Jadey! I think you’ll enjoy them. Pingback: Is the world ready for another Robin Hood tale? | The Many Worlds of Char…. Will be checking out McKay’s books. Good interview.